When adventurous overseas traveler, Amy, is diagnosed with Retinitis Pigmentosa, she has no idea what difficulties lie ahead. 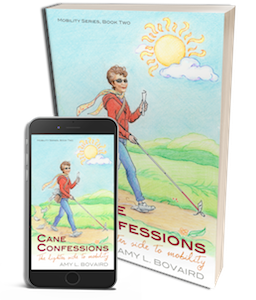 After finishing mobility training from the Bureau of Blindness, she thinks her problems are solved, but when Amy tackles the streets with her white cane, the real fun begins. Determinedly sweeping away her fears, she starts to celebrate the reality of vision-impaired independence. Join the chaos and laughter in this series of uplifting anecdotes as Amy looks to the lighter side of mobility. Note: The Mobility Series books are stand-alone and do not need to be read in sequence. Vision loss, blindness, disabilities, faith, humor.